A handful of veteran punk rock bands formed in the late 80s still exist today, but not many can claim a fairly consistent lineup, with The Bouncing Souls being one of the few exceptions. Formed in 1987 in New Brunswick, New Jersey, the quartet originally consisted of singer Greg Attonito, guitarist Pete Steinkopf, bassist Bryan Kienlen, and drumer Shal Khichi. The latter, however, left the band in 2000 and was replaced by Michael McDermott. However, at the end of the tour came the announcement that McDermott would be leaving the band, which now puts The Bouncing Souls down to a three-piece, albeit one still consisting of all original members. And given that there were no hard feelings involved in his decision, McDermott will play one more show, in December, before officially leaving the group. In addition to maintaining its lineup, the band has also steadily been releasing albums over its more than 25 years of existence, with the most recent being last year’s Comet. The record is the ninth studio recording, and also one which the members are particularly proud of, because they accomplished everything that they set out to do with it. That said, however, Attonito was careful to note that as proud of he is of the newest record, there is no clear favorite among the bunch because they all belong to their own particular place and time. On that same note, however, Attonito did share that while removing one album from The Bouncing Souls’ discography changes things, his own relocation – he lives in Idado while Kienlen and Steinkopf remain in New Jersey – has changed very little. To celebrate this history, the band did something special for its 20th anniversary a few years back, releasing singles, which then went on to form seven-inches, which then turned into the 2010 album, Ghosts on the Boardwalk. In turn, a new single was released for download on the first of each month. Then, every three months, a seven-inch with the songs from that quarter came out. At the end of the year, an additional four tracks were made available to those who subscribed to the series. In the same way, Attonito acknowledged how just as Vega was influential in his artistic vision, The Bouncing Souls are aware that what they do also has meaning. “The most rewarding aspect of what we do may be doing something we love and saving someone’s life doing it,” he said, perhaps referring to the band’s collaboration with Music Saves Lives, or simply pointing out how music can be someone’s salvation. 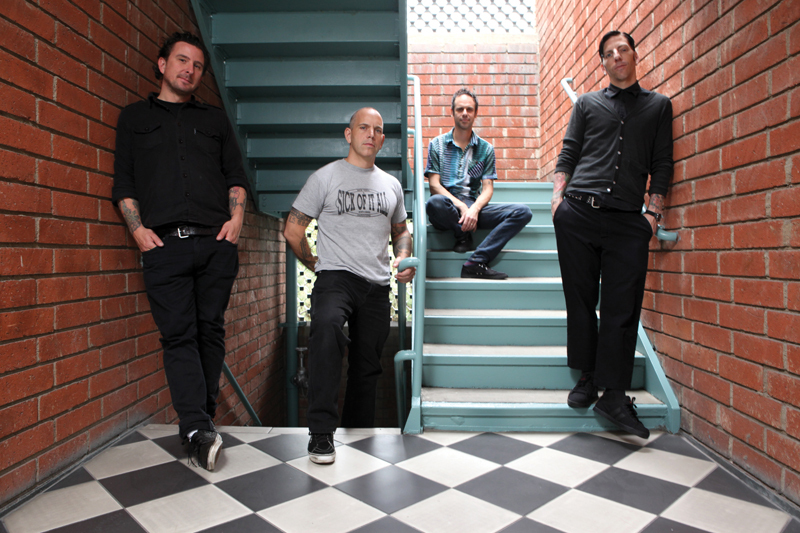 As is the case with many punk rock bands, the members of The Bouncing Souls have strong opinions on political and social issues, and have publicly supported certain causes. Be that as it may, Attonito did mention that they have made a concentrated effort not to let it sneak into the music too much. As an example, he offered up one of his convictions. But while Attonito has no problem discussing this idea with others, he made it clear that the songs don’t have room for political or personal agendas, because they not only impose upon the audience, but they also keep him from enjoying the music as much. After all, while punk rock is undeniably linked with politics, the mindset also speaks to the idea of not allowing the way of the world to weigh you down. This entry was posted in Interview and tagged American, Feature, Interview, The Bouncing Souls. Bookmark the permalink. Leaving politics out of their music is one thing that has enabled them to endure. I’m so thankful for that. This is one of the best bands of all time.